The Sparco Prime KS-10 kart suit is designed to be fully personalised and printed with the customers' own design, while at the same time offering the driver light weight, comfort and breathability. Also available in 2'off the shelf' colour schemes. Complying with the latest CIK/FIA N-2013 Level 2 approval, this 2 layer karting suit features a stretch panel at the rear, perforated stretch panels on the armpits, inner leg and outer thigh which allows the suit to breathe whilst at the same time improving the suit fit. A cordura back protection area increases resistance to wear and tear at the points in most contact with the kart seat. Rounding off the features are a ribbed neck, concealed zip, pockets and a classic belt. CIK FIA Level 2 approved - Suitable for all classes of go karting (except those which require a leather overall such as superkarts). PLEASE NOTE: Picture For Illustration Purposes Only. Picture for illustration purposes only. Our Outlet store is populated via an automated system so stock takes 24 hours to update. 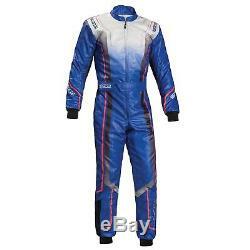 The item "Sparco Prime KS-10 Kart / Karting Race Suit Blue Size 58 00230658AZ" is in sale since Wednesday, August 22, 2018. This item is in the category "Vehicle Parts & Accessories\Car Tuning & Styling\Go-Kart Parts\Other Go-Kart Parts". The seller is "demontweeksoutlet" and is located in Wrexham. This item can be shipped worldwide.